After starting the week like a runaway train with 26.9% on Sunday, Seven’s share has hovered closer to 18% since then. Home and Away was on 761,000, just below Tuesday’s 775,000. The ob doc hour started with Border Security on 723,000 (612,000 last week) and then The Force also did 723,000 (710,000). Two hours of Criminal Minds remain a staple for midweek viewers with the new episode doing 456,000 followed by a repeat on 290,000. The episodes did 486,000 and then 367,000 respectively last week. 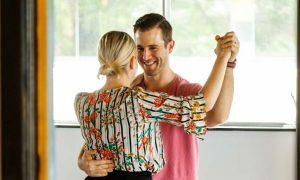 Centrelink and disappearing backyards were two of the topics covered on A Current Affair, which did 859,000, well ahead again of all others in the timeslot. The Block continued with bathroom week as our early favourites appeared to struggle with their bathroom build. Foreman Keith had issues with some of the reno work too, closing down one of the houses overnight with safety concerns. The series dipped just below 1m for the first time since launch. The Grand Final of Britain’s Got Talent was just over 550,000, which was close to 553,000 that were watching in an earlier timeslot last week. Shark puncher Mick Fanning was a guest on The Project with 549,000 after 7pm. The Bachelor was down over 100,000 week-on-week with 715,000 last night. The program remains a magnet for women viewers where it ranked #1 for the night in all key demos. Osher Günsberg was live after the episode last night on Facebook answering questions from the fans. The first episode of the week featured time travel and a surprise first kiss. 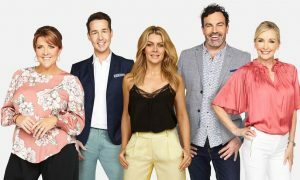 The launch episode last week has climbed to 1.02m metro viewers, up 21% from the overnight audience number, making it the biggest launch episode ever. Offspring was on 559,000 which is bang on what the show averaged a week ago. Hard Quiz returned with season two at 8pm and 601,000 watching. Season one launched in October last year with 681,000 watching. Shaun Micallef’s Mad As Hell reported good week-on-week growth with 722,000 after 644,000 a week ago. Utopia too is building back toward its big launch numbers with 674,000 after 636,000 last week. Media training, a staff dinner and IT issues were some of the challenges Tony faced at the National Building Authority last night. Growing Up Gracefully then did 298,000 followed by Adam Hills: The Last Leg on 202,000. Inside Westminster Abbey pulled the biggest crowd with 242,000 at 7.30pm. The much-anticipated launch of the CBS series The Good Fight then averaged 211,000 across two episodes. Most viewers seemed to stay for both episodes while Melbourne delivered the biggest audience.